There are two anarcho punk fundraising gigs happening this weekend. 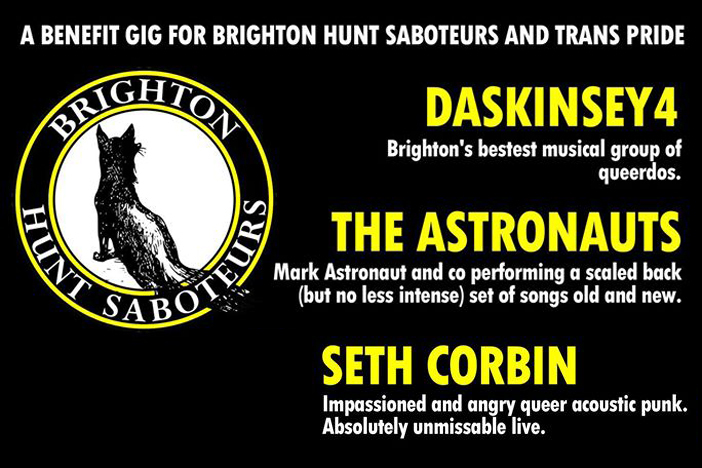 Firstly on Friday, The Cowley Club has The Astronauts, Daskinsey 4 and a debut gig from Rites of Hadda, amongst others, playing in support of Brighton Hunt Sabs and Trans Pride, while on Saturday The Greys pub in Hanover plays host to a Radio Reverb benefit. This all day event runs from midday to 10:30pm with a line up of folkier punkers including POG, Wob, Perkie and El Morgan. Entry is pay what you want but as it’s for a good cause, and to help cover costs, a few quid would be greatly appreciated.